You are not alone. Most preppers grasp that the lone wolf approach to survival is not their best option for several important reasons. One, a prepper would truly need an Army Ranger level of skills to make it very long on their own, no matter how secure their survival retreat is. 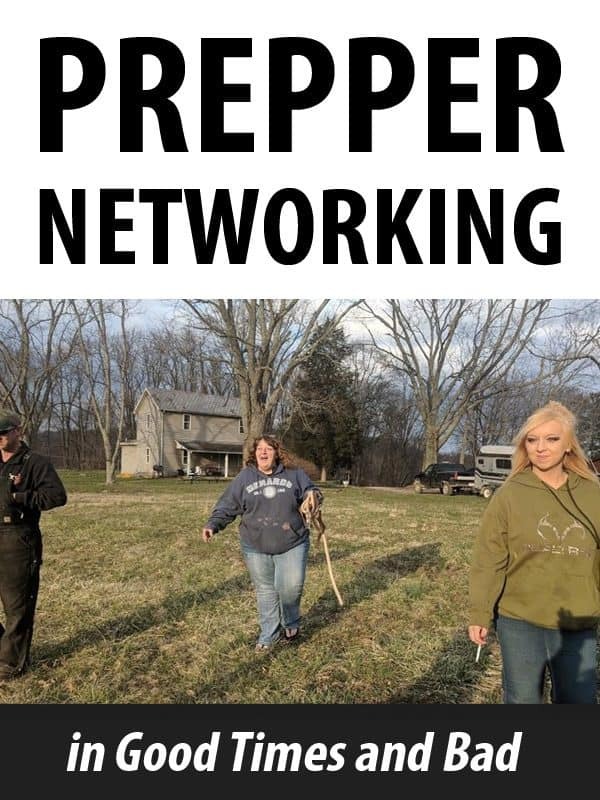 There are two ways to network with other preppers: by joining a local group that may or may not plan to share a survival homesteading retreat during a doomsday disaster or a virtual group or forum where ideas and skills are shared remotely. Some local prepper groups work to devise a neighborhood or community emergency response plan to help prevent marauders from entering the area, to prevent the spread of disease as well as a the sharing of skills and resources both now, during, and after a disaster. It takes bodies to keep a place safe and to deal with medical emergencies. It would be physically impossible to patrol even a small perimeter 24/7 by yourself, or even with the aid of your loved ones – unless you can ride out the apocalypse inside of a cave, which isn’t very realistic. Tending to a serious medical solo will likely cause the end to your struggle to stay alive, as well. Maybe a highly skilled individual with a massive pain tolerance could set a broken bone on their own – but he or she could not ward off attackers, tend to the garden or livestock, or carry water on makeshift crutches. Prepping with your family is a far better idea than prepping alone, but you still may not have enough bodies, skilled or otherwise, to keep everyone safe during a long-term disaster. When you network with other preppers, as scary as that may be for OPSEC reasons (initially), you can quadruple, or more. There will be more hands on deck to accomplish all of the survival chores, especially perimeter defense. The sense of community, being a part of a survival tribe both now and when the world goes pear shaped, cannot be underestimated. You would have to possess a large and skilled family to amass all the skills essential to surviving. These types of families are not commonplace – especially outside of rural areas or in military families. There is a risk involved with reaching out to network with other preppers, but the reward far outweighs it, as long as you enter into relationships with other members only after doing due diligence, with your eyes wide open, and with appropriate caution. One of the biggest benefits of networking with others preppers is becoming part of a knowledge chain and not merely a sole link not attached to anything bigger than itself. This puts a wealth of knowledge, skills, and help at your fingertips. There are various types of prepper groups and we will delve into each later in this article, along with details about some of the most organized. But first, let’s delve into the skill and survival enhancing benefits you can commonly expect to garner when joining such a group. Medical – In addition to having more than the advanced first aid skills of yourself and the members of your family at your disposal, in most prepper networking groups you can expect to find nurses with various advanced or even surgical, training, paramedics, military medics, veterinarians, hospital orderlies and interns, herbalists, pharmacists, and if it is among the most advanced prepper groups, doctors with various specialties. In addition to the need to treat the diseases and colds that will spread rapidly during a SHTF scenario, broken bones, gunshot wounds, heat stroke, hypothermia, and a broad range of serious and chronic health issues, will also need to be tended to. Treating chronic or serious conditions with a finite supply of human as well as animal prescription medications, over-the-counter medication, and natural alternatives must be a part of your prepping plan. Security – To patrol the perimeter of even a small survival homesteading retreat around the clock will take a minimum of at least a few people – and that’s a conservative estimate. A security team of that number may not be able to ward off an attack by even a small and desperate gang. 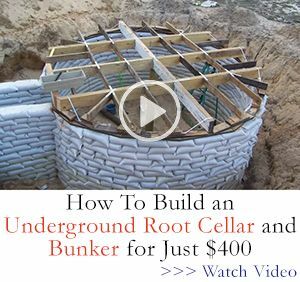 The location of your retreat, the terrain around it, and any explosive devices you can plant to deter entry will be of great benefit for a lone wolf prepper or a single prepper family, but that will only deter the threat for so long. Engineers and Construction Workers – After the initial SHTF threat subsides, perhaps even during, energy and building repairs and additions will be necessary. Having a working knowledge of alternative energy systems, dam and irrigation systems, and buildings gives you and edge when prepping alone or in a small group, but does not give you the same advantage and chances of success as members of a larger group. Agriculture – Taking care of livestock and the garden that will be necessary to put food in the table will also be essential. If two people are on perimeter patrol (more should be) that leaves few hands to tend to the cultivation and preservation of food, among other chores, in a typical American family. Keeping the livestock healthy and productive and the crops healthy through the harvest, are skills more than one person at the bug in location must have to prevent needless loss of your only food source. Hunting really should never be done solo during a SHTF disaster; there will be unprepared people who will kill you to take that deer your just bagged – without batting an eye over the immoral deed. Mechanics – Even if your vehicle is no longer running, or if the roads may not be accessible, knowledge of mechanical skills will still be needed to keep farm equipment and the motors of your alternative energy methods humming. Weapons – The number of firearms and other weapons on hand to expel a threat substantially increases when you partner with other preppers. Even though you have a room full of guns and ammo, you cannot be all the places you need to be in an effort to protect the family, all at once. Your supply of ammo is finite and in all likelihood, you will run through it far quicker than you think when facing an armed thread. Stockpiling the materials to reload your own ammo will make your ability to keep a gun firing longer increase, but again, your supply of reloading materials is also finite. A prepper networking group often boasts several experienced reloaders and gunsmiths, of either the accomplished amateur or professional variety. Will your loved ones know how to repair a firearm or reload ammo all on their own if you get killed or become incapacitated? Alerting the unprepared that you are well stocked when networking with either neighbors or sharing information about your preparedness plans with other folks who at least claim to be fellow preppers, online. If you join a prepper networking group that plans on living together on a survival compound when the SHTF, that will give you a safe place to go when it happens if you can’t bug in where your are – but you still have to make it to the compound as the disaster is unfolding. That’s it, those are the only two cons I believe exist when it comes to prepper networking. Both could cause you to lose your life day 1 of the disaster. But, the risks to communing with other preppers either virtually or in real life, still far outweigh the risks if you cannot create a quality and large enough prepper network among those close to you. Beware of frauds. If the prepper is vague when answering your questions about either group membership or skills he or she would bring to the table if you are forming your own group, take it as a warning sign. Neither an established prepper networking group, survival community, nor a person seeking to join your group will be willing to endanger OPSEC, simple and important facts must be readily shared immediately upon request. Not all of the people in any neighborhood, community, or compound ground will survive the immediate SHTF event. Do not decide to join a group simply because one guy or gal has beyond impressive skills and equipment, and don’t neglect training in those areas because the needs are now taken care of for you. That person might not make it to the bugout location or get killed, hurt, be on vacation, or get trapped at work and never make it back to your neighborhood. We do not tend to alert our neighbors when we come into a windfall of extra money or get a “final notice” from a creditors. Do not reveal any more information than absolutely necessary during the “getting to know you” stage with a prepper group or even with non-prepping neighbors you have known for years for OPSEC reasons. People brag. People lie. Do not take the supposed skill set anyone tells you they have at face value without proof and bet your life on it. Run an online background check on anyone you plan to engage in a close-knit survival partnership with. Read and review any prepper networking group’s policies that moment they are presented to you and again when you are alone and can focus more deeply on what you have read. Then, ask yourself these questions: Is there a monetary commitment to join? Who is in charge of the decision making process and how can they be replaced if necessary for any reason? Can people be ejected from the group – why and how? If you decide to build your own prepper networking group, proper planning, including a detailed set of rules and monitoring to ensure they are enforced even if the group is simply an online forum or a regional meetup group for training purposes. Require background checks for any prepper networking group that is not simply an online forum or comprised of friends and neighbors you know extensively. Coordinate you self-reliance efforts with first-responder agencies, veterans groups, and local officials in your area before going public with your plans if the goal is to create a neighborhood or community preparedness response. If your prepper networking group involves living together at a bug out retreat, set up a rally point with backup locations, as well as a communications system and code words – using both high and low tech tools to help ensure as many members as possible can reach the location and warn others of dangers on the route to the survival compound. Fortitude Ranch – A survival retreat community that has self-sufficient ranches in West Virginia and Colorado (construction expected to be completed summer 2018) with about 12 more planned ranches throughout the community. Prepper Groups – This website functions as a prepper community bulletin board and listing service for preppers seeking to network with other preppers, for established prepper groups, notices of emerging prepper groups, expos, and survival training events. Prepper Meetups – This website also helps preppers network with other members of the survival community. You can search your region for groups seeking members, potential members seeking groups, as well as non-group meetings and trainings to increase participants overall self-reliance skills and plans. American Prepper Network – This website offers a listing of prepper groups throughout the country as well as meetups in a broad range of locations. Vivos – This is the largest known underground survival community in the world – getting into the community will likely require a substantial fiscal investment and an intensive background check. Sheepdogs – This group puts together incredible survival trainings for members. Rad Meter – This website is focused on alerting Americans to nuclear fallout areas, preparedness for a nuclear attack and shares links to intentional survival communities that exist for prepper networking throughout the country. Citadel – This Idaho intentional community is not necessarily designed for preppers, but its foundation in patriotism and pro-Second Amendment beliefs tends to attract self-reliant individuals. Going to a prepper event is a low-key way to get to know other preppers in your area without revealing too much about yourself, your prepper network, or groups plans. Stay away from straight prepper expos is possible. Instead look for hands-on events that, while they have an expo shopping attribute, are more geared to teaching self-reliant skills, like Prepper Camp. 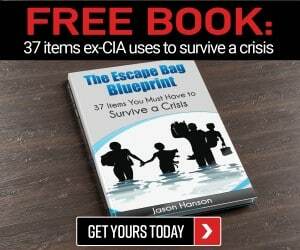 Unfortunately not every state is blessed with ample prepper expos, so joining a virtual group on social media (quite a few exist on Facebook) or attending a skills workshop might be your only connection option. Look for classes and workshops in your area that are not billed as survival gatherings, but are teaching self-reliant, agricultural, weapons, or homesteading skills. 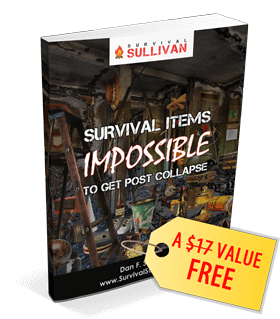 If you are using these classes to enhance your survival skills, it’s extremely likely other preppers in your area are using the workshops as networking tools as well. Perhaps you should do a little more research on Idaho’s Citadel. As an Idaho resident I’m ashamed to say we are considered in the top 5 of most hateful places to live. Citadel is much more sinister than a group of preppers with strong feelings for the second amendment.